The monument commemorating the journalist who hurled his shoes at President George W. Bush was taken down a day after it was erected, local officials in Tikrit told CNN. Assisted by kids at the Tikrit Orphanage, sculptor Laith al-Amiri on Tuesday erected a huge brown replica of one of the shoes hurled at Bush last month by journalist Muntadhir al-Zaidi during a press conference in Baghdad. But officials from Salaheddin province told CNN that the monument was removed after a request from the central government, which has charges pending against al-Zaidi — now in an Iraqi jail. After the request was made, Iraqi police visited the location to make sure that the shoe monument was removed. “We will not allow anyone to use the government facilities and buildings for political motives,” said Abdullah Jabara, Salaheddin deputy governor. Al-Zaidi’s angry gesture touched a defiant nerve throughout the Arab and Muslim world. He is regarded by many people as a hero, and demonstrators last month took to the streets in the Arab world and called for his release. The shoe monument, made of fiberglass and coated with copper, consists of the shoe and a concrete base. The entire monument is 3.5 meters (11.5 feet) high. The shoe is 2.5 meters (8.2 feet) long and 1.5 meters (4.9 feet) wide. The orphans helped al-Amiri build the $5,000 structure in 15 days, said Faten Abdulqader al-Naseri, the orphanage director. Saddam Hussein, the former Iraqi leader toppled by the United States in 2003, was from the Tikrit region. Al-Zaidi’s employer, TV network al-Baghdadia, keeps a picture of him at the top left side of the screen with a calendar showing the number of days he has spent in detention. The network has been calling for his release. By tradition, throwing a shoe, is the most insulting act in the Arab world. Kudos to Turkish Prime Minister Erdogan for his position on the holocaust in Gaza…. a position that resulted in a hero’s welcome on his return home. But what about the ‘other‘ holocaust….. the one in Armenia…. the one that Turkey itself is responsible for. Let’s not bury that in the garbage dump of history… there are still apologies and retributions to be made to the people of Armenia…. go for it Erdogan! The following deals with the remarks on Gaza….. The above quotes are taken from THIS HaAretz report…. The following is from THIS report found at the Palestinian Think Tank site…..
Erdogan: Israel became a gangster state. (to the moderator) I thank you, too. For me, Davos is done for me from now on. I will not come again. You all know this in this way. You are not letting us speak. (Showing Peres) He spoke for 25 minutes, but you let me speak 12 minutes. No way! AIPAC held a dinner in New York yesterday to raise funds to support the ongoing holocaust in Gaza and the rest of Occupied Palestine. Hundreds of angry New Yorkers were there to protest the event…. my cousin Bud, the photographer was among them…. here is a sampling of his photos…..
Thousands of Israelis are relaxing in front of their TV sets this evening watching a free DVD that was distributed with today’s Jerusalem Post. Free hatred c/o American zionism! The DVD is called ‘Farewell Israel… Bush, Iran and the Revolt of Islam’. Farewell Israel??? Are they going someplace?? Or are they trying to convince themselves that without Bush the ‘free ride’ is over? The American Friends For A Safe Israel might consider using their unlimited funds for better purposes…. Spreading hatred and Islamophobia is not the way to guarantee the safety of Israel. Support for the ongoing holocaust in the Occupied Territories, Gaza in particular is not the way to guarantee the safety of Israel. Perhaps these so-called friends of Israel should consider disassociating themselves from zionism…. the real enemy of the Jewish people. Zionism needs enemies to survive, they need to spread hate to insure their continued existence. Groups such as AIPAC and the ADL would cease to operate if zionism had no enemies, therefore they will continue to create those enemies, it’s ‘good for business’. Needless to say, my family won’t be watching that DVD, there are 6 episodes of CSI on the local cable station tonight…. much more enjoyable and entertaining. A statue of a giant shoe has been unveiled in Saddam Hussein’s hometown in honour of the Iraqi journalist who threw his footwear at the former US president George Bush. The statue also features a poem honouring Muntazer al-Zaidi, the Iraqi journalist who shot to international fame last month when he hurled his shoes at Bush during a farewell press conference. The shoes narrowly missed the then president and Zaidi was quickly bundled to the ground by security staff. The public artwork went on display in Tikrit, 90 miles north-west of Baghdad. The Baghdad-based artist, Laith al-Amari, said his fibreglass-and-copper work was a homage to the pride of the Iraqi people. Zaidi, who has since been dubbed by some as the Baghdad Clogger, was charged with assaulting a foreign leader and is in detention awaiting trial. It is really difficult to take seriously those who think that the new American envoy to the Middle East, George Mitchell, has a real chance of getting Israel, the Nazi-like entity, to end its occupation of the West Bank, East Jerusalem and the Gaza Strip, and therefore achieve a just and lasting peace in this tortured part of the world. True, Mitchell succeeded in resolving the 800-year-old conflict in Northern Ireland. However, with Israel in tight control of the American Congress, media and public discourse, it is unlikely that Mitchell will be able to do much in terms of pressuring the apartheid state to take a strategic decision to end its 40-year-old colonialist occupation of Palestinian territories. The factors militating against Mitchell’s mission are numerous and overwhelming. First, Mitchell should be honest enough to realize that Israel has effectively killed any realistic prospects of creating a viable Palestinian state in the West Bank. The building of hundreds of Jewish-only colonies throughout the occupied territories has simply left no room for establishing such a state. This is of course unless a quisling Palestinian leadership will be cajoled or coerced into accepting a “state” made up of disconnected Bantustans and townships under tight Israeli control. Needless to say, such a scandalous sell-out of Palestinian rights would be strongly and violently rejected by a vast majority of Palestinians, and whatever Palestinian “Judenrat” acceding to such deal would be mercilessly crushed and its members killed like stray dogs in the streets of the West Bank. Traitors who trade the national patrimony of their people for money, investment and preferential treatment by America and Israel can’t really hope for a better treatment from their people. This is how traitors are treated everywhere. Moreover, it should be amply clear by now that no Israeli government would be able, even if willing, to dismantle the hundreds of settlements built on occupied Arab land since 1967. The Israeli society and political environment are simply too jingoistic to allow any Israeli government to undo the “gains” of the Six-day war. There are those who may argue that the settlers and their supporters can be overruled by a majority of Israelis who want peace. Well, this is not an accurate appraisal of reality. The settlers and their supporters represent a real majority within the Israeli society and especially within the Israeli army, as the upcoming Israeli elections will undoubtedly show. This is the reason why successive Israeli governments consistently refrained from dismantling even a single settlement, including those created brazenly illegally, even according to the lopsided Israeli law itself. (All settlements are illegal according to international law as elucidated a few years ago by the International Court of Justice in the Hague). Israeli leaders know deep in their heart that dismantling settlements and removing settlers could lead to a Jewish civil war. Olmert, whose election platform a few years ago was based on a promise to remove settlements east of the “Separation Wall,” eventually cringed before the settlers and didn’t dare to remove a single outpost. Hence, it is inconceivable that in the absence of a truly massive political and psychological earthquake hitting the collective Israeli psyche, no Israeli government would be able to embark on the unthinkable task of dismantling the settlements and withdrawing to the armistice lines of the 4th of June, 1967. Needless to say, such an “earthquake” can only be triggered by the United States, Israel’s guardian-ally. However, for such an earthquake to occur in Israel, a stronger political earthquake would have to occur in Washington D.C. first. I am talking about a mental and political transformation, a real revolution that would free the American political class from the stranglehold of American Zionism, the demonic ghoul now gripping America by the throat. This takes us to another question. Is America capable of extricating herself from this Zionist grip? Can America say “No” to the Israeli bully and act on it? Can America outsmart and outmaneuver the tyrannical Zionist clique enslaving America now? I am raising these questions because all the old tools of trying to resolve the conflict in Palestine have been tried ad nauseam and proven ineffective and bankrupt. This necessarily requires new “unorthodox” and “un-classical” tools that would convince Israel that “enough is enough” and that America wouldn’t continue to play the role of powerful whore in the service of Zionist supremacy in the Middle East. But in order to reach such a realization, America would have to think honestly and do a lot of soul-searching. America would have to confront itself with the naked facts about the Nazi-like monster known as Israel. America would have to face the fact that the huge crisis now haunting the American economy is attributed first and foremost to Israel. More to the point, America needs to realize that unless Israel is reined in, America itself will go down. Isn’t America already going down, at least in part because it allowed a tiny criminal entity 10,000 miles away to dictate American policy and behavior toward the rest of the world. After all, it was Israel that by way of deception got the unmissed ignoramus of the White House, George Bush, to invade, occupy and destroy two sovereign Muslim nations and murder or cause the death of over a million human beings. It was Israel that envisaged the so-called “war on terror.” And it may well be proven eventually that Israel stood behind the 9/11 events. Yes, I don’t possess irrefutable evidence proving this point right now, but the cunning Zionist serpent is too demonic, too nefarious and too sly to be given the benefit of the doubt. Hence, I would like to give the following advice to Mr. Mitchell. Don’t be naïve, Israel and its leaders will try to dilute your mission by eviscerating it of substance. They will seek to overwhelm you with mountains of red-herring tactics. They will raise all sorts of issues, real and imagined to confuse you. They will shamelessly raise the issue of terror, ignoring the cardinal fact that Israel herself is the most satanic embodiment of terror in this world. They will speak about “anti-Semitism,” overlooking the obvious fact that Israel’s Nazi behaviors, e.g. the recent genocidal blitzkrieg in Gaza, are the premier generator of anti-Semitism around the world. They will confront you with an avalanche of distractions to divert attention from the real core issue, their enduring Nazi-like occupation of Palestinian land and their unmitigated oppression of the Palestinian people. If you are brave and honest, confront them, let them frown in your face, let them get angry. But don’t cower, or cave in to their bullying tactics, even if they threaten to mobilize Congress against you and your boss in Washington. They might hint to you that the Jews control America and could therefore get the President to fire you. Don’t be impressed by this. Report it directly to Mr. Obama. You are likely to be affronted soon by a man named Benyamin Netanyah, who is likely to become Israel’s next Prime Minister. This man is a pathological liar, a professional propagandist who thinks that effective hasbara (propaganda) is the solution for all problems. Diversionary tactics and verbal prevarication are his policy and sheer mendacity is his modus operandi. So, don’t be deceived by his false magic. Be honest and frank with your boss in Washington. Tell him that Israel doesn’t want peace and is not seeking true peace partners among Palestinians. A country that has built and continues to build settlements on stolen land obviously doesn’t want peace. Moreover, a country that bullies peace partners, e.g. the Palestinian Authority, to act and behave very much like the “Jewish councils” in Nazi-occupied Europe did, doesn’t seek genuine peace partners, but genuine quislings and bona fide collaborators. Also, tell Mr. Obama that Israel and her leaders don’t really take America seriously. I give you one little example. In eight years of Bush’s misrule, and despite incessant and occasionally aggressive demands from Washington to remove roadblocks from the West Bank to enhance Palestinian mobility and help revive the region’s moribund economy, Israel actually increased rather than decreased the number of these evil checkpoints and roadblocks…and they did it under America’s nose. Remember these barriers are erected in the heart of Palestinian population centers, not along side the Green Line, e.g. between Israel proper and the West Bank. They are meant primarily to torment and savage the Palestinian people. This was done while Israeli leaders and officials were having chummy chats with Rice who visited Occupied Jerusalem and Ramalla 24 times. And the result of all her visits was a great fat zero. Well, Mr. Mitchell, try to learn from Rice’s monumental failure…don’t repeat it, even if you have to quit. Israel’s devastating war on Gaza claimed the lives of more than 1,335 persons and left at least 5,500 other wounded. In addition tens of thousands of utilities, houses, businesses, and factories were partially or totally destroyed. The war caused psychological damage for thousands of people especially children. I reported on the war daily and my focus was on the human toll. However, I recently came across a story that changed my focus completely a revealed to me the true nature of Israel’s soldiers and their intent in invading Gaza. Since the ceasefire was enacted, I have toured throughout Gaza to document some stories and accounts. Although I wrote many articles, I decided to focus on the untold stories of the war: the brutal massacre of thousands of chickens. On 5 January, many Israeli tanks, troops and bulldozers advanced into the al-Zeitoun neighborhood south east of Gaza City. In this area, called al-Samouni, Israel killed 49 members of the Samouni family, after soldiers ordered them to gather into a single home, which was shelled several hours later. I continued touring farms in the area where the smell of death filled the air. Surviving chickens roamed around surrounded by thousands of their dead kin. It was an overwhelming scene leaving one to ask only: why? If this question was directed to the Israeli army their response would be swift and predictable. They would likely contend that “rockets” were being fired from the farms, or that there were Palestinian resistance fighters in the area. However, unless the Israeli army is prepared to claim that these chickens were resistance fighters or were firing rockets nothing can explain why the self-proclaimed “world’s most moral army” would engage in the wholesale slaughter of civilians and chickens alike. The status of Gaza has changed from the world’s largest outdoor prison to the world’s largest tent city…..
At least it was until the Israeli blitzkrieg in Gaza…..
An anti-personnel weapon designed to penetrate dense vegetation, flechettes should never be used in built-up civilian areas. The Israeli army has used them in Gaza periodically for several years. In most cases their use has resulted in civilians being killed or injured. Amnesty International’s fact-finding team in Gaza first heard about the use of flechettes in the most recent conflict some ten days ago. The father of one of the victims showed the team a flechette which had been taken out of his son’s body. In its latest post on Amnesty International’s Livewire blog, the team described how on Monday it visited towns and villages around Gaza and found more hard evidence of the use of flechettes. In ‘Izbat Beit Hanoun, to the south-west of the town of Beit Hanoun, several flechette shells were fired into the main road, killing two people and injuring several others on the morning of 5 January. Wafa’ Nabil Abu Jarad, a 21-year-old pregnant mother of two, was one of those killed. Her husband and her mother-in-law told the team that the family had just had breakfast and were outside the house drinking tea in the sun. Wafa’ and her husband were standing by the corner of the house when they heard a noise, followed by screams. They turned to go back into their house but at that moment Wafa’ and several other members of the family were hit by flechettes. Wafa’ was killed outright. That same day, at the other end of the street, 16-year-old Islam Jaber Abd-al-Dayem was struck in the neck by a flechette. He was taken to the hospital’s intensive care unit but died three days later. Mizar, his brother, was injured in the same attack and still has a flechette lodged in his back. In the village of al-Mughraqa on the morning of 7 January, a shell struck the room where Atta Hassan Aref Azzam was sitting with two of his children, Mohammed, aged 13 and Hassan, aged two and a half. All three were killed. The six other members of the family who were in the house fled to the nearest school for shelter. The team examined the bloodstained wall by which the three were killed. It was full of flechettes. 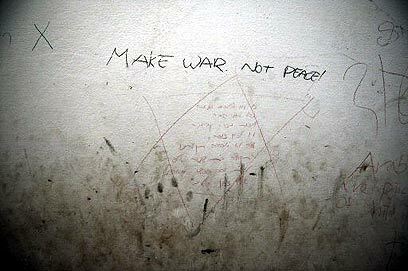 IN GAZA, THE WRITING IS ON THE WALL…. A painful reminder for Operation Cast Lead remained evident in Gaza in the form of blatant, racist graffiti sprayed on houses’ walls by IDF soldiers. Some of the graffiti was sprayed on the ruins of the homes of the al-Samuni family, who lost dozens of its members during the war. 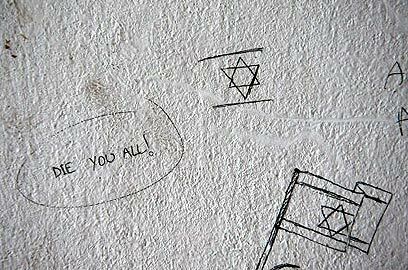 I find it interesting that the IDF will reprimand those responsible for the graffiti….. BUT NOT FOR THE COLD BLOODED MURDER OF INNOCENT CIVILIANS…. Can you think of a better way to honour the memory of Rachel Corrie? I’m not talking about writing a check…. I’m talkng about going to Gaza as a part of a team that will rebuild the hundreds of homes destroyed during the Israeli blitzkrieg. I’m talking about honouring the blessed memory of Rachel Corrie who was murdered on March 16, 2003 by the same monsters that destroyed those homes. I am proposing an ‘army’ of volunteers to contact the International Solidarity Committee to see what you can do…. Let’s call it the Rachel Corrie Solidarity Brigade. What better way is there to spend your winter breaks? Thank you for your interest in joining us in Palestine in the nonviolent resistance to end the Israeli occupation! This is a big decision and commitment and it is greatly appreciated. Please take some time to review the material posted in this section. It will, hopefully, answer most of your basic questions about working with the ISM. If there are questions that you have that are not answered, please contact us and we will be happy to answer them and put you in touch with the closest support group to you. Your first step is getting here! This information is a brief overview of the main travel routes to Palestine, who to contact when you arrive, where to stay, how to get around, etc. Click here for Travel Information & Tips. All volunteers are required to attend a two-day training program. Over the course of the two-days you will learn about the history of nonviolence in the Palestinian resistance and the role internationals have played over the last several years. You will also be introduced to nonviolent direct-action techniques and strategies, group decision making using the consensus system, effective media strategies, etc. Click here for more detailed information about the training program. Remember your first days back to school after summer vacation? Remember hearing the stories from your classmates about what they did during those days? This is not so in Gaza these days… children are not talking about the summer camps they attended or the family outings they participated in….. they are talking about the horrors they experienced during the Israeli bombardment of their schools and homes. The following video takes a glimpse of these children and what they had to say….. This video was NOT aired on BBC or Sky News….. it might ‘tarnish their biased image’….. The Disaster Emergency Committee (DEC) appeal for humanitarian donations to Gaza has been screened on ITV and Channel 4. The decision to screen the film follows point-blank refusals from both the BBC and Sky News, who said it would threaten their impartial image. The controversy over the BBC’s refusal to show the two minute film reached a crescendo today, with director general Mark Thompson forced to go on Radio 4’s Today programme to explain his decision. This is a repost from exactly a year ago today…. I could have written it today…. nothing has changed for the better. “I am an Israeli Arab”…. those words were said to me about ten years ago by my very dearest and closest friend. My response was…. “If that’s the case then I am a Jewish Palestinian”. My statement seemed to make as much sense (or not) as his did…. but things have changed. Today one does not hear the term ‘Israeli Arab’ as often as one did ten years ago…. today there is a stronger identification with the Palestinian people and with Palestine itself. One might ask why that is… there are many reasons. Firstly is the second class status that the Israeli Arab has endured while maintaining Israeli citizenship. He has been treated no differently than Palestinians living in the occupied areas. His villages suffered during Israel’s war with Lebanon last year but compensation for damaged property or lost wages have not yet come to light.Also keep in mind that ‘Arab Israeli’ villages and neighbourhoods are in many cases walled in or surrounded by electrified fences. This is to let the locals know that they are not viewed any differently from the Palestinians living in the occupied West Bank. They are seen as a threat to Israeli society…. which is interesting if you are aware of the following seen in THIS video produced by my Brother Haitham. After watching both of these videos, one has to ask who is a threat to whom…. the answer is obvious. Bedouins living in the Negev, another area within Israel are constantly suffering under the yolk of zionist tyranny. For the most part, these Bedouins serve in the Israeli army, giving their all to the Jewish state. In return they return to their homes only to see their entire village bulldozed to make way for an Israeli road or an irrigation system. They are denied medical care in many of their villages and worse yet, many have been moved close to nuclear facilities where the radiation is slowly killing them off. THIS link has much information about the plight of the Negev Bedouin population. Needless to say. fewer of these Bedouins find themselves identifying themselves as Israelis, they are Palestinians. Last, but not least, let’s not overlook the treatment given to representatives elected to the Israeli Knesset by the Arab electorate. Does the name Azmi Bishara ring a bell? Did we forget the hounding he received from the government, the forced exile he is still under to escape punishment for crimes he did not commit… he is but one example, but the most recent one. Despite all of the above, there is a small section of Palestinians that one can rightfully refer to as Israeli Arabs. They are a small band of collaborators led by one Mahmoud Abbas, the former President of Palestine. Again, despite the above, despite the present siege of Gaza, they still see themselves as leaders of the Palestinian people. Tomorrow they will be meeting with representatives of the Israeli government to ‘discuss’ the events in Gaza. It’s too damn late for those discussions. What is needed are immediate actions to end the siege and to restore calm to the million and a half people whose very lives are at stake at the moment. So bottom line is that the concept of an Israeli Arab is nothing but a myth, unless you are a member of Abbas’ cabinet. The Weekly Al-Ahram carried the following article explaining the events leading up to the arrest of my Associate last week and of his release….. In the past three weeks, dozens of Hamas supporters have either been detained or summoned for investigation by the PA’s much- feared Preventive Security Forces and General Intelligence Service. Coordination between the PA police forces and the Israeli occupation forces and Shin Beth has continued even as Gaza is being destroyed, in pursuit of their common goal of uprooting Hamas in the West Bank. With George Bush now dumped into the dustbin of history , millions of people around the world are hoping that the new American president Barack H. Obama will make a genuine departure from the conspicuously criminal policies that characterized his predecessor’s gloomy era. Non the less, Obama should strive to be more than just a sort of a Bush-lite president. Otherwise, he would be repeating the same mistakes, indulging in the same follies and committing the same crimes, knowingly or unknowingly. Well, Mr. Obama, are you betraying your own history? Your own Afro-American people’s struggle for freedom and justice? Besides, what happened to “give me freedom or give me death.”? Indeed, have you come to think that certain classes of people, the Untermenschen, don’t deserve freedom or can live without it? So, are you Mr. President trying now to reproduce ancient racism and apply it to our people, long haunted by foreign occupation and oppression. Well, Hamas doesn’t need your recognition, Mr. Obama. It won’t do it any good. The US did recognize the PLO nearly two decades ago after the latter recognized Israel. More to the point, a state that uses White Phosphorous bombs against school children, worshipers praying to their God in peaceable mosques, and civilians seeking shelters in UN-run schools is a murderous genocidal state not unlike the Third Reich? Hence, no Palestinian with a modicum of national dignity and self respect should lend legitimacy to this satanic entity. So, Mr. Obama, if you would like to see America respected, not just feared, by Muslims, you hasten to withdraw your country’s support from these rotten and self-worshiping tyrants who torment and savage their own masses on America’s behalf. Non the less, you still have a long way to go. These governments, which the US routinely calls “our allies,” are really really tyrannical police states whose political and moral modus operandi represents the exact antithesis of every sublime value and ideal America holds dear. Yes, embracing tyrannical police states in the Muslim might look expedient in the short run. But in the long run, America will only reap the hostility of hundreds of millions of people in the Muslim world. After an unexpected winter ‘vacation’, hundreds of thousands of children in Gaza returned to school yesterday. In some cases, the buildings were gone, completely destroyed by Israeli bombs. In most cases, classmates were missing, murdered by Israeli forces. Can any of you imagine the trauma of these children, many of whom lost close relatives, including parents, brothers or sisters? For decades, this has been a way of life for the people living in the Occupied Territories of Palestine, Gaza in particular. In other words, the way of life is the way of death. The scars inflicted on these children by those horrors will never heal…. no form of therapy or counseling will alleviate the pain felt by these children…. they will be forced to live with it their entire life. Over 60 years after the Eastern European Jews suffered from the same atrocities the scars and pain remain. In most of those cases the German government pays a monthly allowance to the surviving victims. Who will pay that allowance to the people of Gaza? Are they not entitled to compensation as a result of their suffering and losses? Where are the demands for this to happen? Does anyone care? Yes, the bombing stopped, Yes, the tanks pulled out, but the victims are still suffering. The mourning periods are coming to an end as I write this, but does a parent ever stop mourning the loss of a child? Does a child ever stop mourning the loss of a parent? Yes, schools are open again, but these children have so much to learn about coping. Don’t ever forget their suffering and do what you can to help them. Here is how you can help…….